Yesterday at the Farmers’ Market, we picked up cucumber, eggplant, zucchini, mushrooms, yellow squash and a huge bunch of basil. I have a small pot of basil growing in the backyard, but it looks very sad so I was happy to see a gorgeous bunch for only $2. Pesto time! 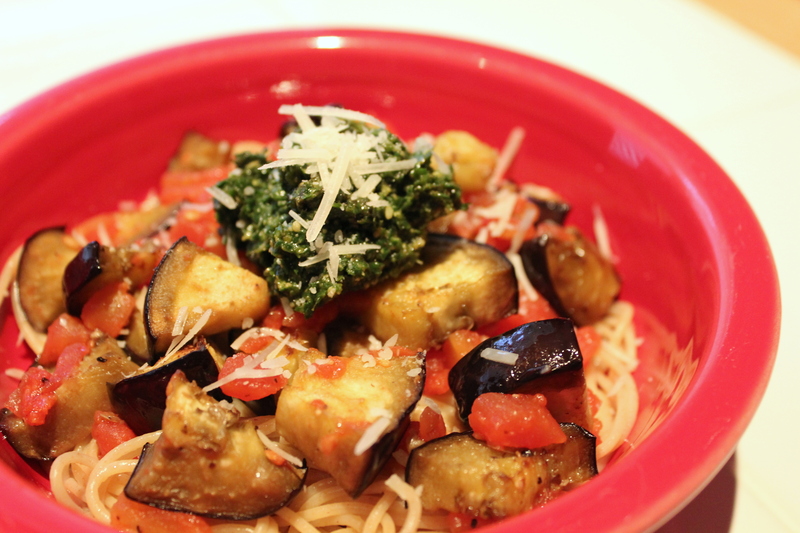 Tonight I roasted the eggplant, tossed it with some leftover tomatoes from the recipe yesterday, threw it on some whole wheat spaghetti and topped it with the fresh pesto. Eating local is easy and tasty! This entry was posted in Food by Diana. Bookmark the permalink. It’s totally hit and miss with vegetables, never can predict even with normal ones like carrots. Depends on the day. She wouldn’t eat this. She is good about at least trying stuff.